Hi readers! Happy Sunday, thanks for popping by today! Please give a big warm welcome to special guest and Monday Challenge DT member, Anna-Karin Evaldsson! 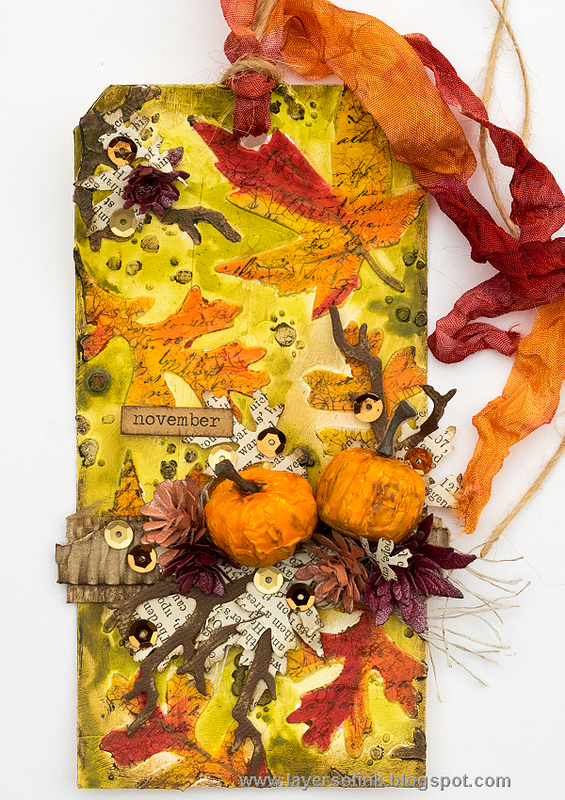 She dreamed up this GORGEOUS Autumn inspired tag, and I just love how it turned out! Read on to learn more! Hi everyone! I am so happy to be here with you today, on the second last day of October, with a fun tutorial. I love to see the seasons change and autumn has been absolutely gorgeous. This tag celebrates the beauty of the season, but the techniques would work just as well for any theme or project. 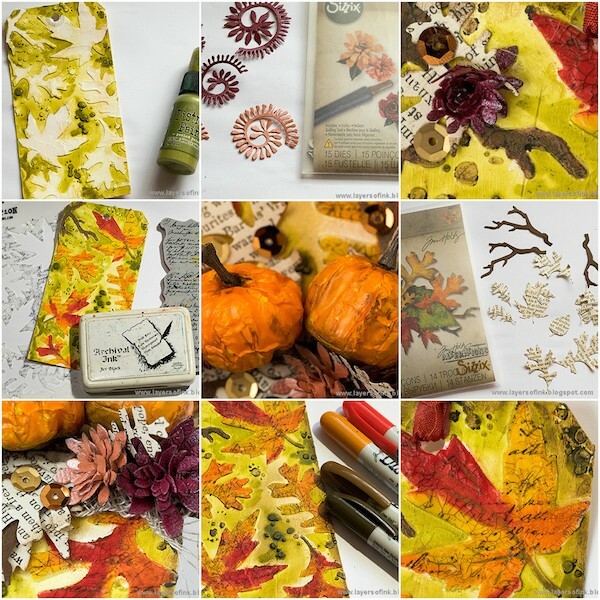 You can easily adapt the techniques for a card, scrapbooking layout or art journal page. I love to try different background techniques and for this tag I wanted to play around with a stencil to create a textured leafy background, with lots of yummy embedded layers. I used mainly products by Tim Holtz for this tag and took step photos so that you can easily see what I did. 1. Start by coating a manila tag with white gesso and when that is dry, apply Texture Paste through the Autumn Layering stencil. You can also use another stencil, but make sure that it isn’t too detailed, but has some open space for you to work on. 2. Paint the background with Peeled Paint Distress Paint. Let dry. 3. Coat the background with a layer of Distress Collage Medium Matte. The reason for doing this is that the Texture Paste is very porous, which can make paints and ink look lighter on top of it, since some of the paint is absorbed into the paste. I wanted my leaves to be vibrant, and the Matte Medium sealed the paste. 4. Paint the leaves with a variety of Distress Paints and add a few veins. Don’t worry if it doesn’t look perfect. 5. 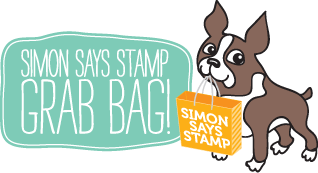 When dry, put the stencil back on the tag and stamp through the stencil with a script stamp. I stamped on scrap paper first, and then stamped repeatedly before re-inking again. 6. Place the stencil back again and apply Distress Collage Medium Crazing with your finger, varying the thickness. The thicker the paste, the thicker the cracks. Let dry. 7. Rub Distress Crayons into the cracks. I used Rusty Hinge, Candied Apple and Vintage Photo. Add a bit of Walnut Stain around the edges. It is easiest to leave the stencil in place when applying the crayon. Remove excess with a slightly moist paper towel. 8. I die cut some Tim Holtz Tiny Tattered Florals from Simon Says Stamp wonderful Glimmer Cardstock. 9. Use the slotted quilling tool that comes with the die set to roll the flowers. If you want to see this in action, I have a tutorial, including a video, on my blog, for the Tiny Tattered Florals. 10. Die cut branches from brown kraft-core cardstock and leaves from old dictionary paper. Ink the edges of the leaves. 11. Place a strip of burlap and a torn strip of cardboard on the tag as a base for the embellishments. 12. Glue a piece of Linen Ribbon to the cardboard and then glue the leaves and branches in place. Continue with the pumpkins and the flowers. 13. Did you see that my pumpkins look textured and a little different from what they look like in the packaging? By mistake, my box of idea-ology Pumpkin Pieces Findings got squashed at home. First, I was upset when I saw that some of the pumpkins were damaged, but then I realised that it actually made them look interesting. So I squashed them up some more and used them on this tag. 14. The Glimmery Cardstock is so glimmery in real life that it is hard to capture on a photo. You can see it a little better here perhaps. I love it. I also used quite a bit of the Glimmery Cardstock on a recent art journal page, made with the new Believe in the Season release . I also added some 28 Lilac Lane Neutrals Sequins to the tag. 15. 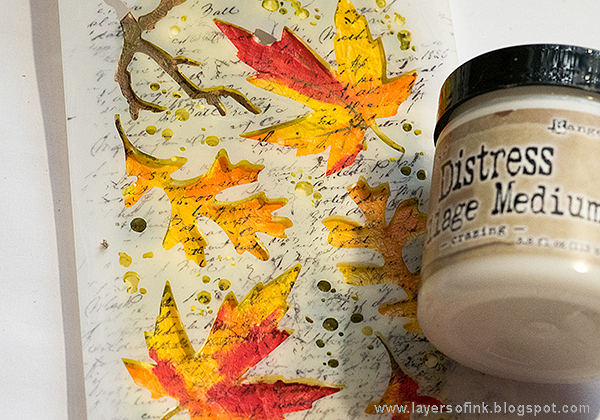 I really like the look of the layered leaves, with the paint, script stamping, Crazing Medium and Distress Crayons. It makes them stand out from the background, and be a part of it, at the same time. I think the same technique would look great with a snowflake stencil too. 16. Add one more flower, a couple of leaves and sequins at the top of the tag. The Crinkle Ribbon was dyed with Aged Mahogany and Rusty Hinge Distress Ink. I hope you enjoyed this tutorial and that it inspired you to play around with some background techniques. Thanks for reading today, and thanks to Anna-Karin for this awesome tutorial! Wow! Awesome tag! Thanks for the detailed instructions! This is a fantastic tag, so much detail! AnD a really good tutorial, too! Snyggt! Awesome job! Yes fall has been so pretty here in Sweden and this tag really displays that well! Good job! Beautiful tag ! Love different background techniques in here. Some great techniques for creating this beautiful tag. LOVING The Inspiration!! THANKS for sharing!! Lovely tag idea! Thank you for sharing! O M G !! Fabulous colors and layers and creativity! And I do so appreciate the instructions to create this festive tag !!! This is lovely, Anna. Thanks for the step by step instruction! Awesome and thanks for sharing. such an amazing tag!! beautiful! Stunning tag, I love all of the textures and beautiful fall colors! Very awesome tag ! Thanks for the detailed directions – would love to create a similar one !!! Pretty cool pumpkin and leafy tag. With the steps details, seems like you could tranlate this this this to a daor, art journaling page, scrapbook page and a whole host of other projects. Love the tag and the technique involved. Wow! Incredible tag. The leaves are awesome as are those little pumpkins. What a great tutorial. Thanks for the inspiration. Oh, wowzers! i love all the fantastic color and texture. Truly stunning. Wow, this is incredible! Absolutely beautiful work of art!! Very intricate design. Love how you put all the elements together and added the 3D pumpkins and flowers. Fabulous! WOW! tons of texture, depth and gorgeousness!!! TFS! Wow, love all the texture. Very nice. Very cool! Thank you for the step by step. I am still creating projects with leaves on them too. Thank you for sharing. Gorgeous leaves and fall colors! Love the texture! Wow, like how you used so much tevhniques! Looks so good! Hi! I love this and am thinking of doing postcards in a similar fashion. I have Golden’s Light Molding Paste and am wondering if that might work the same way as the Texture Paste you used. Can you advise? Thanks! One Stamp, Five Ways: Birthday Numbers!